1. As someone who lives outside of the Chicago area, I don’t often get to enjoy a baseball game on the south side of Chicago. On the rare occasion that I’m able to plop myself into a seat in Guaranteed Rate Field, I hope and pray to whomever may be listening that the game in front of me is a good one. Often that’s not the case. On Sunday, however, Miguel Gonzalez gave me everything I asked for and more. I had taken to Gonzalez last year when he placed another feather in the cap of Don Cooper and his reclamation projects. 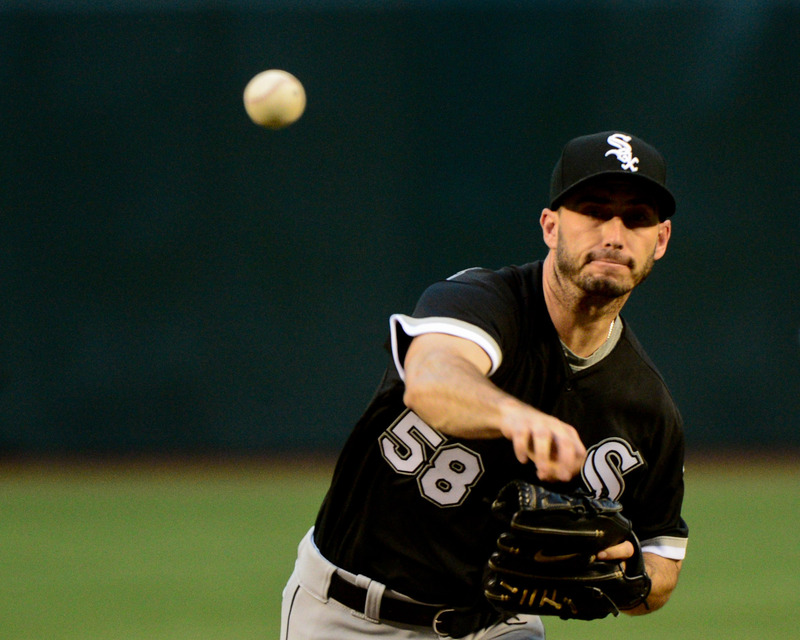 The Jeff Samardzija situation could be tossed away as Gonzalez went from “please, please be better than Mat Latos or John Danks” to reliable fourth or fifth man in the rotation after being claimed on waivers from the Baltimore Orioles. This season has been a bit of a struggle, but as I basked in the sun on Sunday afternoon, Gonzalez threw away all the disasters of past starts and treated me to a splendid pitching performance. For a few hours, Gonzalez reminded me, every White Sox fan in attendance, and those watching at home that, in baseball, an incredible feat can be accomplished any day by even the most ordinary of players. While the perfect game, no-hitter, and shutout were wiped away in comic fashion by three successive batters, the value and awe of Gonzalez’s effort were not lost. 2. Gonzalez wasn’t the only pitcher in the Chicago system to put together a great performance this past weekend. On Thursday, Lucas Giolito was pitching the first half of a doubleheader. That meant the game would only last seven innings. Giolito managed to pitch a technically complete game without giving up a single hit. It was a no-hitter with a big fat asterisk, but it was a no-hitter nonetheless. For a struggling Giolito, the confidence that comes from such a feat could be enough to get him back on track. Alec Hansen had himself a fine start Sunday in low-A Kannapolis. The gargantuan righty, armed with a terrifying pitch face, mowed down hitters on his way to a seven inning outing where he gave up just five hits and a single run. Most impressively, he was able to strikeout 15 batters while walking none. The White Sox have been methodical with their assignments for Hansen, who dropped in the 2016 MLB Draft because of his lack of command and utter collapse in his final college season. There’s also no rush in moving a pitcher of Hansen’s ilk through the system. If he can slowly progress as a starter and clean up his delivery, the White Sox may have found a diamond in the rough. His raw stuff and athletic build instilled enough confidence in the BP Prospect team to rank him 97th among all prospects coming into the season, and Sunday’s performance was a strong indicator of why those evaluators thought so highly of him. 3. It hasn’t been a successful start to the season by any means for Todd Frazier. While a year ago his average similarly sat right around the Mendoza line, he was crushing dingers left and right. This year, he’s failed to raise his average and fallen way behind the home run pace he set for himself just a season ago. With just six home runs on the season in 41 games played, he’s on pace to barely crack the halfway mark to the 40 he hit last year. One thing Frazier has excelled at is seeing a lot of pitches. He leads the league in pitches seen per plate appearance at 4.42, but unfortunately that doesn’t directly lead to success. While it’s been pounded into hitters’ heads that seeing more pitches is a good thing (and perhaps it is in the long run), it doesn’t appear to have a direct effect on the stat line of the hitter. 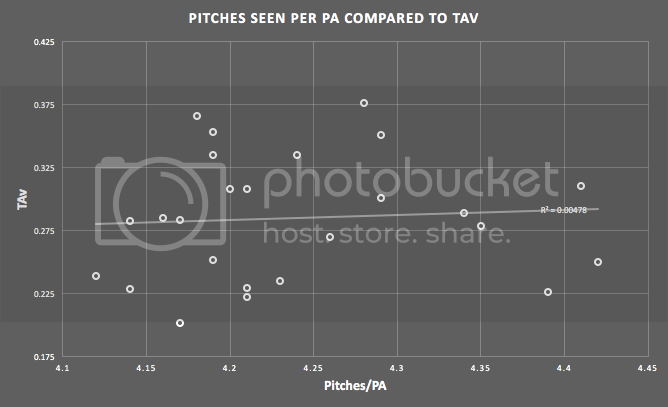 In fact, I whipped together a little chart showing the correlation between TAv and pitches seen per plate appearance is essentially no correlation at all. It may be a sign of better things to come that Frazier has been relatively patient at the plate, but the results simply aren’t coming. He did hit a screaming home run in Sunday’s game, but the White Sox severely need him to heat up in the coming months in order to gain some value in return when he’s inevitably traded at the deadline. Hopefully the slow start can be chalked up more to his bout with the flu than any permanent deterioration in skill. 4. The White Sox pitching staff struck out 49 Tigers hitters throughout their weekend series that spanned three days and four games. With Tyler Danish, Mike Pelfrey, Derek Holland, and Gonzalez taking the mound in each of the four games, that’s a bit of a surprise. Pelfrey was able to find a way to mysteriously miss bats, and the bullpen took over and dominated in the first game. Danish showed good stuff, along with Holland and Gonzalez in their starts. Those combined with a strong weekend from those in the bullpen resulted in a lot of swings and misses from Tigers hitters. 5. Our good friend and former editor-in-chief James Fegan wrote brilliantly about Yolmer Sanchez’s effect on the White Sox clubhouse. While his humor and playfulness off the field has a significant effect on the players, especially on a young rebuilding team, it has been his presence on the field that has mattered the most. In 2015 when he acted as the White Sox everyday second baseman, he hit just .224/.268/.326 with a 61 wRC+. It has never quite clicked for Sanchez at the major league level. That is, until now. Sanchez is in the midst of his best season to date. While there is a fear of regression on the horizon, he is still in good shape to surpass his career-best mark of 61 wRC+. Right now he’s hitting .306/.346/.430 with a 109 wRC+. It’s not the prettiest line in the world, but for a player that has oft struggled to reach even the Mendoza line while showing little to no pop in his bat it’s been quite a year. His month of May has been the most impressive of all with a 126 wRC+ in just shy of 100 plate appearances. He hasn’t had a season like either of the Garcias, Leury and Avisail, but his clubhouse presence combined with competence at the plate has made him a valuable asset to the 2017 Chicago White Sox.